In a non-stick fry pan, cook the sausage until it is nice and crispy on the edges. Remove to a dish lined with a paper towel to drain. 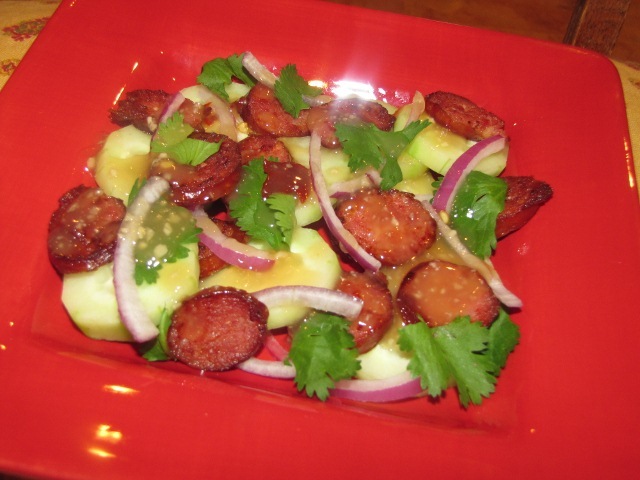 Arrange the cucumbers, sausage and red onion on two salad plates. Sprinkle the cilantro on top. Drizzle the sweet chili garlic sauce over each salad (I used about 2 tablespoons per salad). Delicious!